Who can use an Air Purifier? Where can I use an Air Purifier? 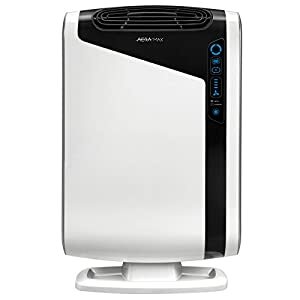 The top 10 best air purifiers for allergies, asthma, dust, mold, mildew, pet dander, and smoke are discussed here for you to be healthy and happy. Discover the finest types for functions, features, and looks for your home at affordable prices. Energy Star® certified air purifiers would save you money on your electric bill and provide environment benefits as well. Timer modes provide convenience and digital controls are easy to read. Some units come with hand-held remote control units. 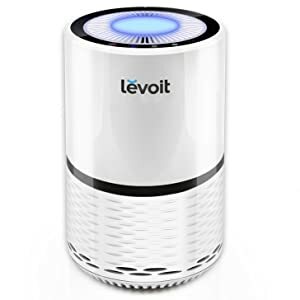 I have used this model Levoit Air Purifier with True-HEPA Filter with excellent results for my stuffy summertime allergen sensitive nose and sinuses. With the 3 different filters, everything is blocked out. I move it to my bedroom at night, turn off its lights, and it’s so quiet I sleep soundly without stuffiness or sneezing now. The easy to use unit is highly endorsed for its effectiveness and all the praises I can give it. The Pure Enrichment PureZone is the most exciting air purifier I’ve ever owned! I’ve had many, especially when the kids were little. I use this one for my sinus congestion and am thinking of getting another one for the musty smell in the laundry room. What was a selling feature for me is the one only filter that holds the 3 filters as one item. It is easier to change than the 3 individual ones. My first HEPA filter in this air purifier lasted about 6 months. I am so thrilled with this model and know you will be fond of it as much as I am. To rid your home of contamination and pollutants, the small electrical piece of equipment, known as an air purifier will improve your air quality in a matter of only a few days. The air will be cleaner, not feel as heavy, dust will be gone, and everyone will breathe better. If you want a small humidifier, try using a diffuser with essential oils or without oils to be a small humidifier with only water added. It will cover a small local area and provide benefits. Anyone who wants clean air can use an air purifier. Air purifiers have no side effects and all people want healthy air to breathe in. No one wants to dust furniture constantly for pet hairs and dander and vacuum the carpet everyday. Put a portable air purifier in any room of your house. You might want it in the room where you spend the most time, or purchase several for constant purification in other rooms. You might spend a lot of time in the lower level or basement of your home and an air purifier would be beneficial there as well if the basement has mold spores and a musky smell. Always place them two feet from walls and doors to permit airflow. Grill-style air cleaners use filters. Material can be fiberglass, cotton, foam, or synthetic fibers. The material compactness control the particle size passing through it. Thick dense filter material grab super small particulates in the air. Pleated filters have an increased surface are to grab the particles. Some filters can be washed and some must be replaced. HEPA (High Efficiency Particulate Air) filters remove particles to comply with the US Department of Energy (DOE) regulations. Any material can be used for the filter but is must meet the standard of 0.03% for particles 0.3 micrometers in size and larger. Airflow is specific for penetrating the filter. HEPA filters are used in high-end vacuums and other devices using filters for home use or industrial use. Activated Charcoal Filters are used as an adsorption (not absorption) material for capturing fumes, odors, and chemicals in your air. A familiar adsorbent is activated charcoal that is porous with tiny areas to catch molecules passing into it. Large particles stick to the numerous pores in the charcoal. The air purifiers use a corona discharge for producing ions that are negatively charged molecules. Dust and other large particles are easier to be ionized since they are larger to be passed through the corona discharge. Two metal plates in the air purifier are charged with one being negative and one positive that attract the particles that are drawn to each other when they have opposite charges where they cluster with each other and become heavier to settle from the air. Ultraviolet (UV) light causes specific microorganisms to be harmless and non-reproductive. Airborne viruses, bacteria, and mold spores pass through the UV light that cleans the air as the pathogens pass through killing them. Similar to an ionizer, the ozone generator alters oxygen molecules and turns them into ozone. These molecules have three oxygen atoms. In nature, the atmosphere is dioxygen that is made of two oxygen atoms. Exposed to UV light or a corona discharge, some of the molecules split into free oxygen atoms. Some of the atoms make ozone yet most of the oxygen combines again into dioxygen. As for ozone, it is a toxic gas, that is not a stable molecule, can react with other chemicals in the air making new compounds that can be more unsafe than the ozone. Manufacturers of ozone devices state that ozone disinfects the air, provides health benefits, and deodorizes the air. There are compelling indications that this is not true. Ozone causes corrosion and rusts metal. Clean Air Delivery Rate (CADR) is the amount of filtered air volume returned to the air after being filtered by the air purifier. Three measurements are specified for dust, tobacco smoke, and pollen. The greater the CADR number the higher the air purifier is filtering your inside air. Many different brands of air purifiers will have this seal. The acronym means Association of Home Appliance Manufacturers with the certified Clean Air Delivery Rate (CADR) logo. The testing certification is used for rating air purifiers by the Consumer Union for its publication of Consumer Reports. This test and certification is recognized by the American National Standards Institute, ANSI. CADR was established in the early 1980s and AHAM in 1967. CADR shows the rate of pollutants and contaminates reduced in a testing chamber. This test determines the air purifier’s capability for removing certain particulates in a controlled chamber and it is measured for its ability to remove 0.10 to 11 microns from the air for pollen, dust, and smoke. Particle percentages are converted to numerical rates ranging from 0 – 400 for smoke and 0 – 450 for pollen and dust. The test results tell you comparison numbers to determine the performance of air purifiers. It gives an overall performance of the filtering system as well do help you determine how large of a unit you will need for your situation. It is difficult to purify air in large areas if you purchase an air purifier that is too small. When you buy a unit that is too small, the air purification will not be done well. You will be wasting your money. To determine the square footage of the area, multiply the length by the width of the room. A room that is 12- by 14-feet = 168-square feet. Purchase a unit that is not more than 67% of the room size you want the air purifier to clean. If your room is 168-square feet, 67% of that is 113-square feet. You will have more air changes per hour (ACH) from your unit so do the math. Do not purchase a unit that only delivers 2 air changes each hour. Allergy sufferers like to have 5 or more air changes each hour. There is no one air purifier that is better than another. You will need to identify the type you want, the features, and whether it has a remote control, and if it works for your square footage for the area you want to cover. Most manufacturers of air purifiers indicate the decibel (dB) level for each fan speed. This comparison might help you understand the dB rating better for air purifiers. 60-65 dB Normal Talking @ 100 ft.
90-dB Train Whistle @ 500 ft.
140-dB Jet Engine @ 100 ft.
Each person perceives sound differently. Sound levels can be affected by “traps” such as drapes and carpet and be quieter. Sound will reflect when there are no soft surfaces to absorb the sound vibration. Your distance from the unit will change the sound; the speed will change the decibels. The faster (higher) it runs the louder it will be since it is running faster to push more air. The lower the fan, the lower the noise level. Check your manufacturer’s manual for the filter reset button location how to use it. Airflow rate is a huge consideration when purchasing an air purifier. Airflow is measured in CFM (cubic feet per minute). Air is a gas and it can be calculated by its mass or volume. The air cleaner manufacturers describe airflow in volume. 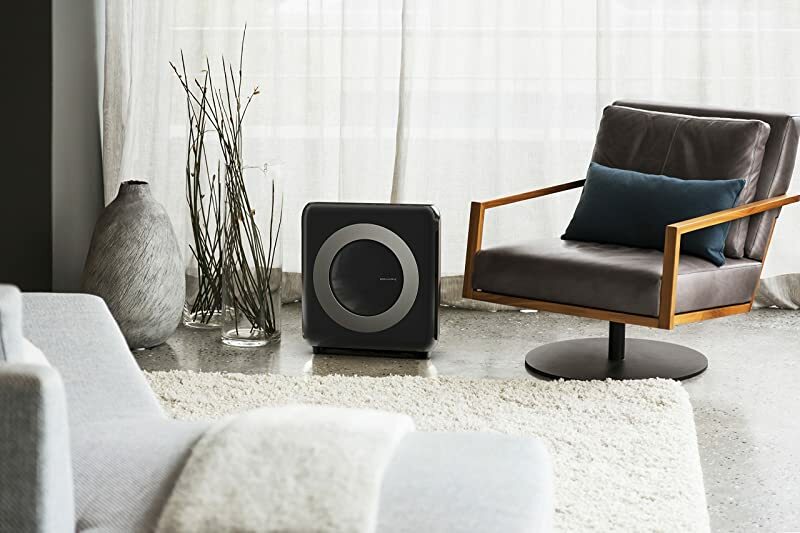 Airflow is contingent on two aspects: the built-in fan and the filter’s efficiency. Air Changes per Hour (ACH) lets you know the number of times the air is replaced in an hour. The higher the number the better it is. The number can fluctuate between 1 and 7. The higher the number the more the efficiency. If your home has contaminants, it is best that the unit is capable of handling 2 or more air changes each hour. Be sure when researching different models for how many air changes the unit performs each hour. Some of the air purifiers are less expensive and are most efficient when the fan is running full power and that causes noise. With more high-end models, the number of air changes will be more with lower fan settings. There is no actual service to be done for an air purifier. A long-life LED or LCD indicator light will illuminate when it is time to change the filters. Some air purifier models will provide electronic readouts with built-in timers to indicate the length of time filters will last. 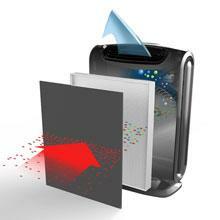 Dust sensors detect particle concentration in the air by using optical sensing devices. The dust sensor detects very small particles such as cigarette smoke from larger particles such as dust. For the 60+ millions of Americans afflicted with asthma, allergies, COPD, and other respiratory issues, you will find that air purifiers today are made with efficient filters, the best one being True-HEPA, for removing pollutants in your home or where you spend most of your time. We say air purifiers are “friendly” because they respond to your problems. For allergies, asthma, dust, mold spores, pet dander, viruses, bacteria, smoke and more pollutants, air purifiers are considered in the brand names enumerated below. Don’t we wish we could bring the fresh air outdoors inside? If you work from home, go home from work, or stay at home, isn’t it wonderful to know you can have the best air possible with an air purifier? 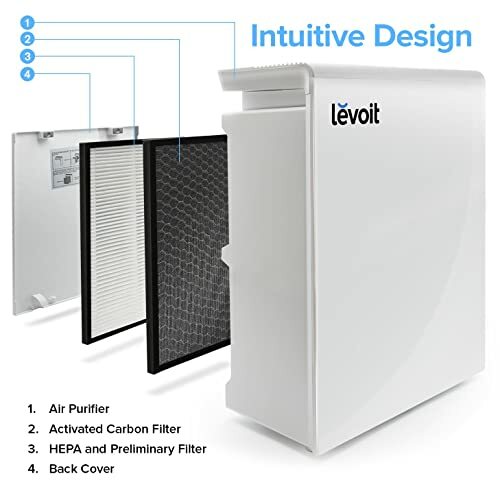 With the Levoit air filter, it has the ability to remove 99.97% of indoor pollutants and impurities to remove particles as tiny as 0.3 µm (microns). A human hair is 50 µm. That’s impressive for particle removal with filtering air pollution of PM 2.5 (pollution rate). The CADR (Clean Air Delivery Rate) is 40 CFM (cubic feet per minute). The air purifier removes bacteria, mold spores, dust, dust mites, fungus, large particles, and pollen. It is superior for babies, youngsters, elders, and everyone. This is an air purifier, not a humidifier, and not a diffuser. It does not use water and does not use oils. 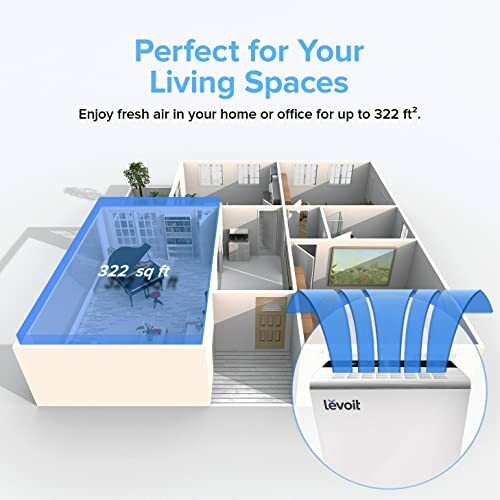 The Levoit Air Purifier model number LV-H132 is affordable so you can have one for each room and the office too. It has 3 speed settings of low, medium, and high with options for various conditions. It’s equipped with nightlight functions with 2 brightness settings. The lights can be turned off completely if you like that best and I do. This air purifier also runs whisper quiet at 5.50 dB (decibels) while you sleep. Even though the unit is not “intuitive” because it has no soul with instincts or inborn abilities, it is fantastic with its automatic sensors for monitoring your air quality created by intelligent humans. I love it and you will too! 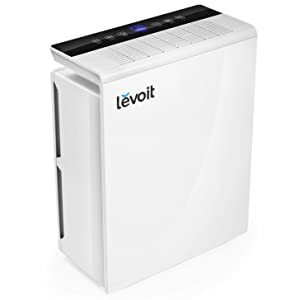 Use only the Levoit Replacement Filters LV-H132-RF to keep product performance and the Warranty made for this air purifier. Cheap imitation products will not work. Carefully remove the new 3-stage filters from their plastic packaging and place them into the unit. The activated carbon filter (black) should be installed first, followed by the HEPA filter (white), then the preliminary filter (black). Make sure the pull tabs are facing outward. The Levoit unit will not compete with furniture or your big screen TV! It’s shorter and smaller than a chair with a tremendous ability to not be in the way of your fresh air. Put it on your coffee table, side table, fireplace mantle, or on the floor. Plug the UL® listed cord into a USA 110/120-Volt outlet using 8-Watts power. For those outside the USA, Canada, or Mexico, you will have to buy a 220/240-Volt adapter to run the unit. The dimensions are 14.6 inches tall x 9.8-inches across and weighs about 3-pounds. Gift-wrapping is available for those you love concerned about their air quality. You will receive a User’s Manual, the 3 filters, and a 2-year Warranty with free lifetime support for any questions or concerns you might have. 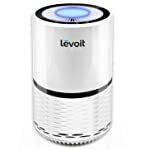 Levoit LV-H132 Air Purifier with True-HEPA Filter Review video. 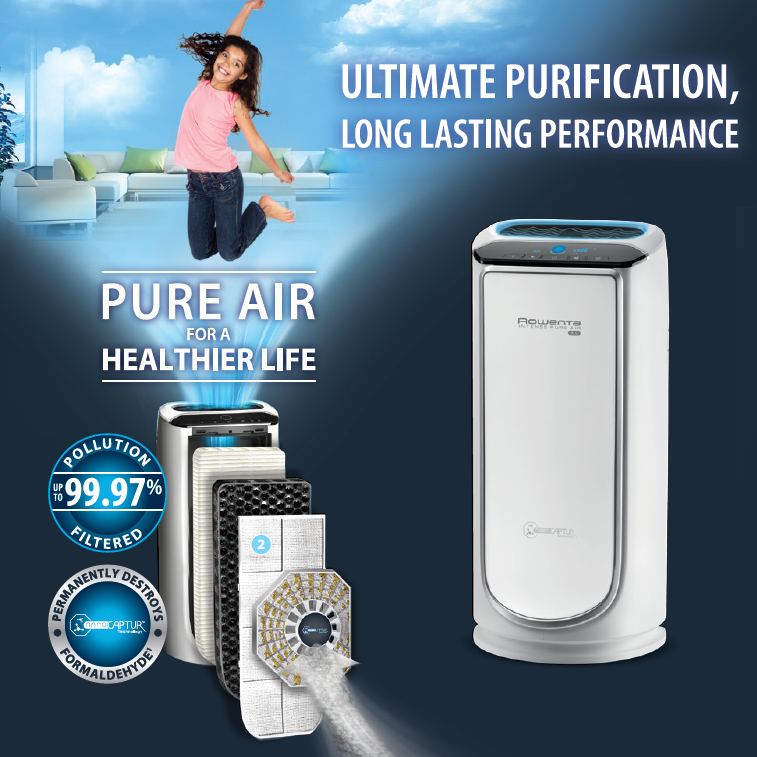 The Pure Enrichment® PureZone model number PEAIRPLG, is indeed an air purifier to have and is a bestselling unit on Amazon.com®. Whether you have it in your home, child’s room, or at the office, it does what it says it will do. The coverage space is up to 200-square feet and even more. My space is 300-square feet and it works great in that room. There are small blue LED lights for functions on the top panel. 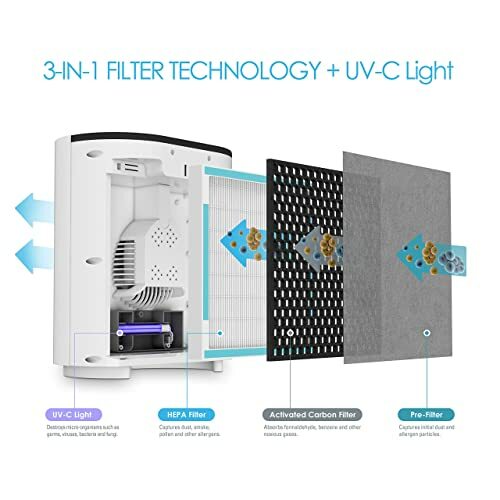 The PureZone True-HEPA filters are 3-in-1 meaning you will have the pre-filter, the activated carbon filter, and the HEPA filter as one filter unit rather than the typical 3 separate filters. That means when it’s time to change them, you only have to deal with 1 filter unit. 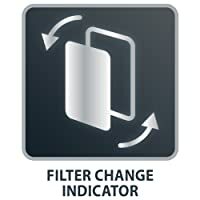 You will have the filter indicator to let you know when it’s time to change the 1 filter of 3 different filters. This 1-filter system is truly convenient. The filtering system not only disinfects and decontaminates your area in just a few hours’ time making your air more wholesome to breathe, it runs quietly to not interfere with what you are listening to at less than 30 dB (decibels) on low, 40 dB on medium, and 50 dB high. A whisper is 30 dB, 40 dB is a computer, and 50 dB is most newer refrigerators. The filters will remove up to 99.97% of particulates as small as 0.3 microns in your air especially wonderful for those with allergies, asthma, COPD, and other respiratory problems. Particulates are the particles of dust, pollen, pet dander, smoke, mold spores, germs, bacteria, and household odors. It will also get rid of the musky odor often reeking in basements in humid climates. You will like the 3 different speeds for the fan of low, medium, and high with an automatic timer that you set. The unit will shut off automatically after the hours you set it to run at 2-, 4-, or 8-hours of continuous operation. It’s just a foot tall and will fit into all areas without being a bulky item to hide. The natural color will harmonize with your design scheme and be lovely to have around. The UV-C air sanitizer is UV for ultra violet and the ‘C’ means the LED (light emitting diodes) for air treatment applications where the characteristics of UV-C LEDs can give unique solutions for disinfection. The UV feature can be turned off. The purifier does not emit ozone. It uses UV-C light to purify the air. The dimensions are 12.1-inches tall x 10.8-inches wide x 6.9-inches front to back and weighs about 8-pounds. The CADR (clean air delivery rate) is 80 cfm (cubic feet per minute). The UV wavelength is 254 nm (nanometers) and the lamp life is approximately 20,000 hours—that’s 833 days running non-stop for 24-hours each day, or about 27 months. It is not Energy Star® rated. Plug the UL® listed cord into a USA, Mexico, or Canada 110/120-Volt, 50/60 Hz outlet. The output power is 60-Watts. Those in other countries will need to buy a 220/240-Volt adapter. It will set up in 5-minutes out of the box. 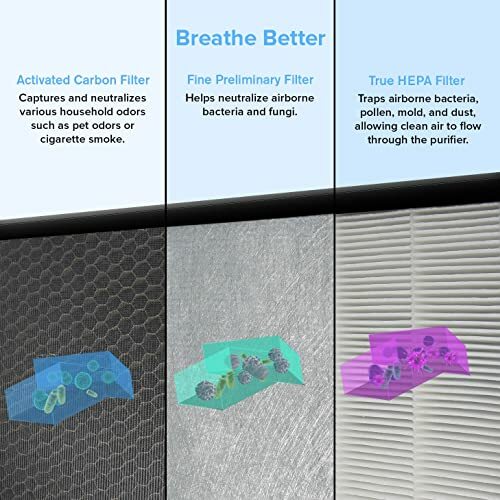 New filters can be bought at Amazon—Air Purifier Replacement Filter: 3-in-1 True HEPA Filter Compatible with PureZone Air Purifier—or at Pure Enrichment® PureZone website here. The User’s Manual says you can wash the filter. A new 3-in-1 filter is about $15 to $20 lasting 6-months or more depending on how long you use the unit. Gift-wrapping is available for those you love, elders, those with respiratory issues and dear friends. You will receive the air purifier, the 3-in-1 True-HEPA filter, and 5-year Warranty with 100% satisfaction guaranteed to you. It is made in China. Pure Enrichment® PureZone 3-in-1 Air Purifier Review video. The Guardian Technologies™ Pet Pure™ True-HEPA filter with UV-C (ultraviolet) sanitizer and odor reduction is a #5 best seller on Amazon. The model number AC4825 is a 22-inch tower that is attractive for any home environment and is doctor recommended. It is Energy Star® certified to save electrical energy and cost. 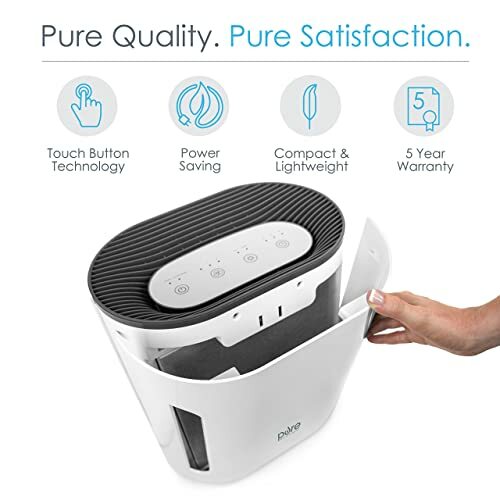 The 3-in-1 True-HEPA air purifier is perfect for allergy sufferers. 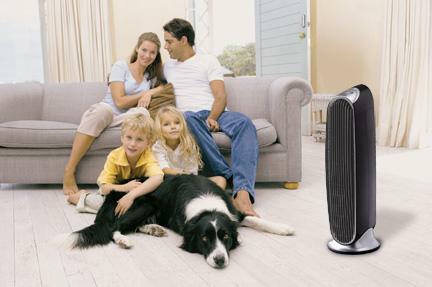 With a True-HEPA filter, it captures 99.97% of dust and allergens as small as 0.3 microns in size. According to the American Academy of Pediatric Allergy and Immunology, doctors recommend HEPA air filtration to reduce exposure to indoor asthma triggers. More than just a filter, the UV-C light kills bacteria and germs, while the charcoal filter captures odors. UV (ultraviolet) + C is a shorter wavelength that is germicidal and completely absorbed by the ozone layer and atmosphere. [100-289 nm, 4.43–12.4, 0.710–1.987 photon energy (eV, aJ).] UV-C light is highly effective at penetrating thin-walled germs like viruses and bacteria altering the genetic structure of the germs, and they die. The unit is CADR rated at 100+, is lightweight and ideal to use in medium-sized rooms. The unit includes a UV-C control and a filter change indicator. The 3-speed controls with a manual control knob include an ultra-quiet low speed. The pre-filter catches the large dust particulates, lint, and pet hair. The charcoal filter is an added layer of protection for capturing odors. The HEPA filter captures dust mites, mold spores, and pet dander. With its titanium dioxide activated by the UV-C light, the remaining household odor molecules are decomposed caused by smoke, cooking, and pets. No ozone is used with this unit. It does not have an ionizer and uses UV light to kill germs. The unit comes with red and/or blue indicator LCD lights that blink when first turned on. When the unit is on, the light is red. It will blink when it is time to replace the filter or UV-C bulb. If they blink, hold the UV button for 3 to 5 seconds to reset the system until the lights stop flashing. Now it will run properly. There is no remote control unit. Replace the filter (FILTER B/FLT4825) every 6 to 9 months depending on how much you use the unit. Replace the Combination Filter every 6 months to maintain a good level of air purification. The filter turns from white to dark gray or black when it is time to replace it. The air blows out of the right side when facing the front. The 3 fan speeds are low, medium, and high and the unit can run 24/7. The construction is durable plastic. The dimensions are 21.5-feet tall x 9-feet wide and 5.5-feet deep and it weighs 7 pounds. Plug the 6-foot long UL listed cord into a USA 110/120/60 Hz-Volt outlet; input 60-Watt and 0.5-Amps. The bulb is 8-Watts. The unit pulls approximately 60- to 65-Watts on high with the UV on and about 25- to 30-Watts on low. One complete filter system is included with the unit. The filters are not washable. Replacement filters must be genuine Guardian Technologies for maintaining product performance and Warranty. On the top of the unit is a small hole. After replacing the HEPA filter, insert a pen tip into the ‘HEPA reset’ located on the top panel of the unit. The manual states it covers 155-square feet, yet other users say it covers 1200-square feet. You will receive an Instruction Manual with a 3-year Limited Warranty listed in the back of the booklet. 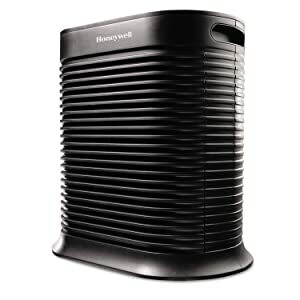 The new Honeywell® True-HEPA Whole Room Air Purifier with Allergen Remover, model HPA300BHD is Energy Star® certified to cover 21- x 22-feet or 465-square feet. The black unit traps up to 99.97% of airborne allergens that are 0.3 microns and larger passing through the filters such as smoke, pollen, dust, mole spores, and pet dander. The air intake is from the front and clean air emits from the top. 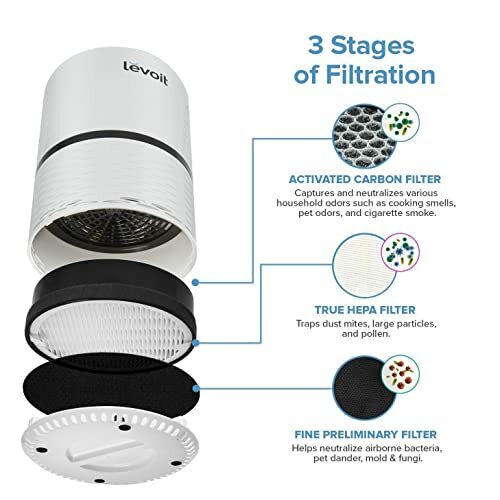 The activated carbon pre-filter decreases odor combined with the True-HEPA filter for keeping your house free of foul smells, volatile organic compounds (VOCs), bacteria, viruses, and allergens. This unit provides easy to touch controls with 3 air-cleaning modes and will automatically shut off when the timer is set. By default, the unit timer can be left on to run 24/7. The turbo clean setting and 2-, 4-, and 8-hour timer setting permits you to run it the length of time you desire. There is no remote control unit with the product. You will also receive filter replacement reminders. The Honeywell® replacement pre-filter is HRF-AP1 and True-HEPA filter is HRF-R3 (3-Pack). The pre-filter is good for 3 months and the main filters last 1-year and cannot be washed. The Honeywell® air purifier is the number one system indorsed by 7 out of 10 medical doctors and allergists for treating allergies and asthma. 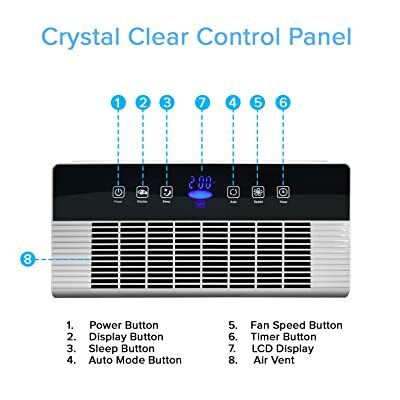 Using its mechanical filtration method, the fan draws the micron sized particles in your air forcing the air through the HEPA filter where the air is cleaned and circulated back clean into your room up to 5 times each hour. The filtration treatment does not produce negative ions so no ozone goes into your environment. Therefore, anyone with breathing conditions such as COPD, emphysema, and asthma will feel better. The unit is rated dust at 320 for the AHAM and CADR testing standard, tobacco smoke 300, and pollen 300. CADR is the volume of air filter by the unit and the higher the numbers the faster the air is filtered. Honeywell® meets the industry’s precise regulations for Clean Air Delivery Rate (CADR) Performance and the Association of Home Appliance Manufacturers (AHAM) for clean air compliance. Plug the UL listed 6.3-foot long cord into a USA 110/120-Volt; 60-Hz; 127-Watts at the highest fan setting at 1.10-Amps. There is no UV light in this air purifier. The dimensions are 22-inches tall x 20.8-inches wide x 10.83 inches deep and it weighs about 20 pounds. A complete set of filters is included in the box. You will receive a User’s Manual and 5-year Warranty from Kaz USA shown in the manual with your Honeywell® air purifier. 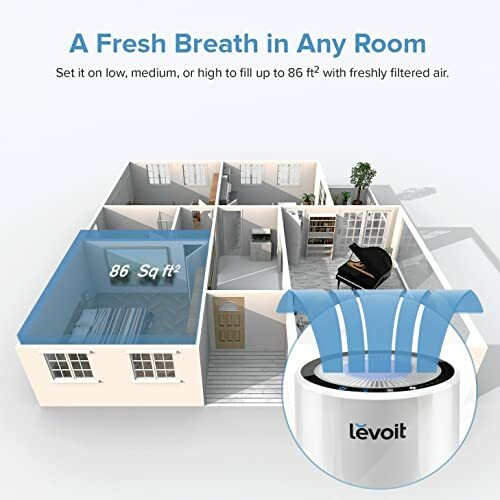 The Levoit air purifier model number LV-PUR131, a top selling unit on Amazon.com® will remove pet odors, smoking, cooking, and musky smells from your home or office, including the basement. It is a square white design and will fit easily anywhere on the floor. It will cover a 322-square foot area to remove 99.97% dust, pollen, mold spores, pet dander and odors. The filters will capture particles as tiny as 0.3 microns. It will filter pollutants in the air at 2.5 PM (particulate matter). Particulate matter is also called particle pollution, and can be a combination of exceedingly tiny particles and liquid droplets floating about in your air. The PM is not a pollution rate but the size of the particles established by the EPA. The term fine particles, or particulate matter 2.5 (PM 2.5), refers to tiny particles or droplets in the air that are 2.5 microns or less in width. The air purifier is great for babies, kids, elders, pets, and anyone wanting to breathe fresh clean air. The CADR (clean air delivery rate) is 135+ cfm (cubic feet per minute). Relieve sinus and nasal congestion when using this air purifier. Be sure to remove the plastic covering for the filters before installing or the unit will not work or could be ruined. It is not Energy Star® rated. Use the LED control panel for activating the sensor for monitoring your air quality. It’s easy to do and don’t forget to set your fan speed to low, medium, or high. It has an air quality indicator and the lights are color coded. Set the time from 1- to 12-hours to shut off automatically. You will sleep peacefully with the quietness of this unit. Put the sleep mode to the lowest setting for fresh air with no noise sleeping. The air purifier is 100% ozone-free and does not use UV lights and is not an ionizer. Never worry about your pet birds—they are safe and will breathe better as you do with this unit. It is recommended you use genuine Levoit filters. Other filters will be the same size, but not made of the same component materials as the authentic Levoit keeping up the impressive performance and not voiding your Warranty. You can buy them on Amazon every 6-months using model number LV-PUR131-RF. The Levoit is CE and FCC approved and certified. Plug the UL® listed cord into a USA, Mexico, or Canada 110/120-Volt, 50/60 Hz outlet. Those in other countries will need to buy a 220/240-Volt adapter. The dimensions are 18.5-inches high x 14.5-inches wide x 7.25-inches front to back and weighs about 10-pounds. Gift-wrapping is available for those you love, elders, those with respiratory issues and dear friends. You will receive the air purifier, the 3 separate air filters, and 2-year Warranty with lifetime support from Levoit. It is made in China. Levoit LV-PUR131 True-HEPA Air Purifier video. The WINIX upgraded model number 5300-2 replaces the 5300-model made for your home, basement, garage, or office. It uses a 3-stage cleaning process using an odor reducing carbon filter with a 99.97% True-HEPA filter with the WINIX PlasmaWave® Technology. It does seize and hold pollen, dust, pet dander, hair, smoke, mold spores, odors, and VOCs (Volatile Organic Compounds) as tiny as 0.3 microns. No ozone is produced. The control panel will display an LED alert until the filter is changed. On average, the carbon pre-filter needs to be changed every 6 months and the True-HEPA filter needs to be changed every year. 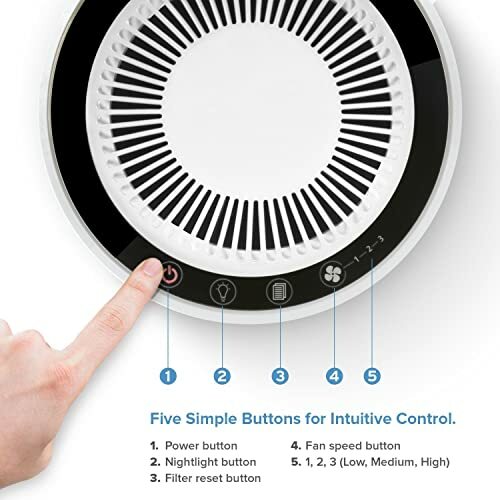 The Smart Sensor air quality indicator and the Auto Mode adjusts the fan to filter the air as needed with the sleep mode for silent night-time operation. The unit covers 360-square feet and the CADR (clean air delivery rate) covers this area although the cfm is unknown. The CADR (Clean Air Delivery Rate) is: dust 243; pollen 246; and smoke 232. It is whisper-quiet at 27.8 dB. It is Energy Star® rated. The dimensions are 23-inches tall x 15-inches wide x 8.2-inches front to back and weighs 15.4-pounds. It does not come with a remote or extra filters. Plug the UL® listed cord into a USA, Mexico, or Canada 110/120-Volt, 50/60 Hz outlet. Those in other countries will need to buy a 220/240-Volt adapter. The output is 70-Watts. You will receive the air purifier, the 3 separate air filters, and 2-year Warranty. It is made in the Republic of China. 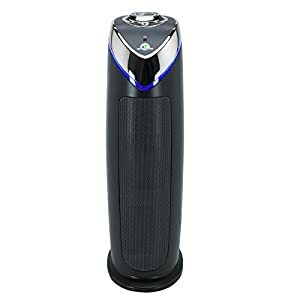 WINIX 5300-2 Air Purifier demo video. The Coway Energy Star® certified model AP-1512HH black or white unit traps up to 99.97% of airborne allergens that are 0.3 microns and larger in size with its True-HEPA filter. The pollutants pass through the filters such as mold spores, pollen, smoke, pet dander, and dust. The unit will cover 361-square feet using the KACA standard. The BAF (British Allergy Foundation) approved HEPA filters, AHAM (CADR) smoke is 233, dust is 246, and pollen is 240 for good breathing air. The Coway has a pre-filter, odor filter, True-HEPA filter, and vital ionizer. The air purifier has 3 fan speed levels with auto and eco modes. The timer can be set for 1-, 4-, and 8-hours. It has a filter indicator light for when it’s time to change the filter. An air quality indicator is also a feature. The eco mode lets you save energy on your utility bill. The Coway airflow rate is CADR 2.68 CFM (cubic feet per minute) (7.6 CMM (cubic meters per minute). The noise level is 24.4 to 53.8 dB depending on the fan speed. The lower the speed, the lower the dB. The unit has been certified by the California EPA Air Resources Board (ARB) as either not producing ozone whatsoever or emitting ozone in a concentration of less than 0.050 parts per million (PPM) to be exceedingly low or nonexistent. Plug the UL listed 6.3-foot long cord into a USA 110/120-Volt; 60Hz; 14.9 to 77.8-Watts depending on fan speed at 1.0-Amps. The dimensions are 18.31-inches tall x 16.81 inches wide x 9.57-inches deep and weighs about 12 pounds. Gift-wrapping is available for a loved one or friend. You will receive a User’s Manual and a 3-year Limited Warranty. 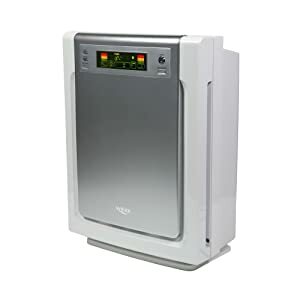 Coway AP-1512HH Mighty Air Purifier Unboxing-Review video. Winix is a South Korean manufacturer in business for over 40 years with a corporate office in East Dundee, Illinois. They are a leader in clean air technology for the home with its premium air cleaners. The model WAC9500 offers 99.97% efficient True-HEPA Filter, Odor Control Carbon Pre-Filters, and PlasmaWave™ Technology. PlasmaWave™ technology generates both positive and negative ions to create plasma clusters that instantly neutralize viruses, bacteria, chemical vapors, and odors. You will be able to remove lingering odors, allergens, and pollutants in a 284-square foot large room area using the AHAM (CADR) room size rating. it is a great unit for allergy and asthma sufferers and is the ultimate for pet dander and hair. The Winix is Energy Star® certified. The color for the body is gray and the sides are white to harmonize with your home décor. The unit breaks apart odor, allergens, chemical vapors and other pollutants at the molecular level without producing any harmful ozone. The Winix PlasmaWave™ uses a corona discharge purifier that creates ozone, but since the ozone emitted is less than 0.05 ppm regulated by the EPA, these devices are marketed as emitting no ozone. You can turn the PlasmaWave™ feature off. The washable advanced odor control carbon filtration, anti-microbial hair collecting pre-filter; and PlasmaWave™ technology work together to provide top-quality control of pet dander and odors, as well as other household odors and allergens like pollen, mold spores and smoke particles. The electronic display is digital and there is a remote control included. The unit has 3 smart sensors for you to set and forget about it, 4 fan speeds, and an auto mode and sleep mode. It has 5 stages of air cleaning and an air quality and light sensor. The pre-filter is washable and the advanced odor control (AOC) carbon filter is washable as well. The HEPA filters are not washable and must be replaced. The unit has a replacement filter light to let you know when new filters need replacing. The replacement filter part number is 21HC4. The unit is UL and ARB certified. The AHAM (CADR) values for dust are 182, pollen 194, and smoke 183. It comes with a remote control and uses 2 AA batteries included. Plug the UL listed 6-foot long cord into a USA 110/120-Volt; 60-Hz; power consumption 6- to 70-watts on low/turbo mode. The dimensions are 21.9-inches tall x 16.5-inches wide x 8.9-inches deep and weighs about 24 pounds. The unit comes with an extra charcoal filter, a User’s Manual, and a 1-year Warranty. 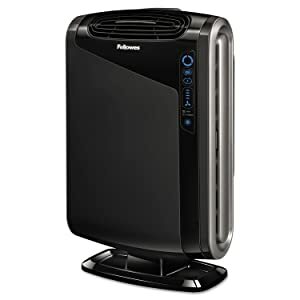 The Rowenta air purifier, Rowenta reference number PU6010 (PU6010U0), Amazon model number 7211001961 is a new product for this company covering 835-square feet—a larger area than most. 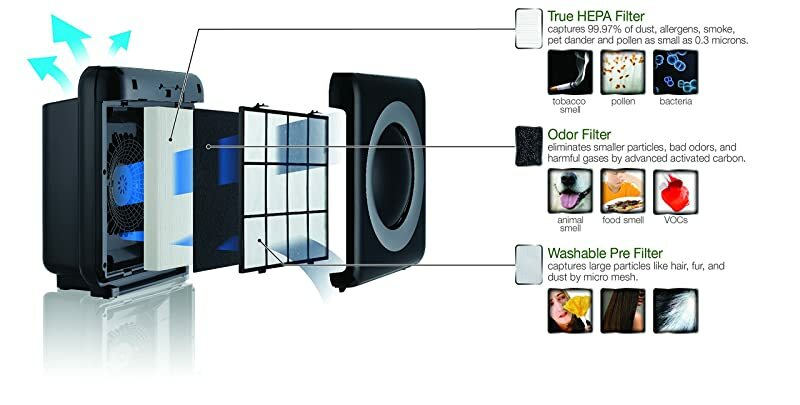 The 4 filters include a prefilter, for capturing pet and human hair; an activated carbon filter for removing odors and VOCs (volatile organic compounds); a True-HEPA filter for getting rid of dust mites, pollen, hair, bacteria, viruses, mold spores and for destroying formaldehyde, a very toxic indoor chemical found in carpeting and furniture upholstery with the filter’s Nano technology using the round looking Nanocaptur™ filter. It has a filter change indicator for changing the HEPA and carbon filters but no air quality indicator. The unit will remove 99.97% of pollutants. The 8-hour programmable timer/delayed start, blue ambient mood lighting around the air outlet, are shown on the easy-to-use dial controls on top for your choosing. The fan has 4 speeds and airflow settings. There are no casters to move it around. The unit is made of plastic and metal in white with the fan blades made of plastic. The oscillation is left to right, not up and down. The base, post, and fan guard are metal. The CADR (Clean Air Delivery Rate) for smoke is 80; dust 91; pollen 105; and the CFM (cubic feet per minute) air volume is 2436 cfm. The unit is Energy Star® certified and AHAM (Association of Home Appliance Manufacturers) rated. Read more about AHAM here. Knowing the replacement filters is important and they are available: active carbon filter XD6066, HEPA filter XD6076, and the Nanocaptur™ filter XD6086. Plug the 6-foot UL® listed cord into a USA, Mexico, or Canada 110/120-Volt, 50/60 Hz outlet. Those in other countries will need to buy a 220/240-Volt adapter. The output is 50-Watts. You will receive the air purifier, the 4 separate air filters, and 1-year Warranty. It is made in China. Rowenta Intense Pure Air Purifier - How it works video. The Fellowes® air purifier is made by the same company that makes shredders for home and office. The model AeraMax 300 (item number 9320501) will cover large rooms 300- to 600-square feet, has an air quality indicator sensor to monitor the air and will adjust the fan speed keeping your air purified. The display is a touch screen, and the control type is auto/manual/Aera+™. It does not have a programmable timer or timer. It does have a filter change indicator light. It also has 4 fan speeds. It is available in black or white. It has the True-HEPA filter for removing 99.97% of airborne particles as tiny as 0.3 microns. These include smoke, odors, pet dander, hair, allergens, mold sports, bacteria, viruses, and dust mites. It helps those with allergies and asthma, COPD, and other respiratory problems. The CADR (Clean Air Delivery Rate) is 191 smoke, 196 dust, and 188 pollen. The carbon filter grabs large particles and simultaneously removes odors and produces no ozone. It is Energy Star® certified to keep running costs lower and is AHAM (Association of Home Appliance Manufacturers) rated. The AeraSafe™ antimicrobial treatment will give you built-into the HEPA filter protection from bacteria, mold, mildew, and fungi growth stinking smells. These odors cause horrible sinus and regular headaches. With its PlasmaTRUE™ technology an ionized field is created for helping to remove pollutants by capturing them in the filters. The filter life is 12-months for the HEPA and up to 3 months for the carbon filter. The filters are not washable. There is no remote control. Plug the 6-foot UL® listed cord into a USA, Mexico, or Canada 110/120-Volt, 50/60 Hz outlet. Those in other countries will need to buy a 220/240-Volt adapter. The output power is low 6-Watts, turbo 86-Watts. The AeraMax 300 maximum power consumption is listed as 86-Watts, which is approximately 0.72-Amps. The dimensions are 25.13-inches tall x 16-inches wide x 8.13-inches deep and it weighs 12.5-pounds. Gift-wrapping is available for family and friends. You will receive the air purifier, the HEPA and carbon filters, User’s Manual, and 5-year Limited Warranty. It is designed at the Fellowes® Company in Illinois, USA and made in China. Fellowes AeraMax 300 Customer Review. Locate your air purifier near the outlet and avoid using an extension cord. If you must use an extension cord, make sure it is rated for an appliance with the correct AWG. Some air purifiers are polarized at the plug meaning it has a blade wider than the other. It fits only one way to avoid shock. Some units have a 2-prong plug and some have 3-prong grounded plug with a rounded end next to the two blades. Do not use an adapter to plug it in. It will not be grounded and a fire could start. Countries outside of the USA need a 220/240-Volt adapter. Know that 220 is 110-Volts twice—the power used for clothes dryers and electric stoves. If anyone plugs a 110-Volt plug into a 220-Volt outlet, the unit will spark and die. It cannot be fixed. Refrain from putting heavy things on the air purifier and do not sit or stand on it. Always turn the air purifier off and disconnect it from the wall outlet when changing filters or cleaning it. Air purifiers should be placed at least 2-feet from walls, doors, and furniture. Check your User’s Manual because some units need 3-feet of clearance. We hope the information presented here has been beneficial for helping you understand more about air purifiers. Be healthy and shop wisely!